How Roode! : Heffalumps and Doodles? I seriously don't know how so many of the participating artists create full-color painted pieces EVERY DAY. I don't really consider this sort of art a "sketch," even if it is a fairly quick approach to color. I've been just doodling on paper most days, posting a photo of the drawing if I don't totally hate it, then taking it to full color if I really don't hate it. I suppose, one of these days, I should actually start with color and make it a speedpaint exercise. In other news, an app I designed should be launching soon, so I'm excited to post screenshots of that. There's also a game for which I'm providing animation and effects, launching most likely before the Summer, so I look forward to sharing work from that, as well. And there are MANY other projects in the pipeline, so stay tuned! I don't know how they do it every day either!! 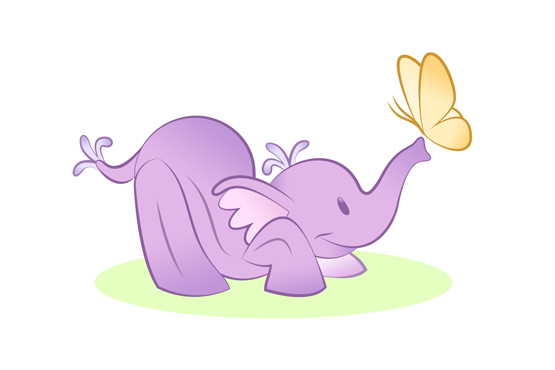 :D Cute Heffalump tho! This looks to me like it was made in illustrator.